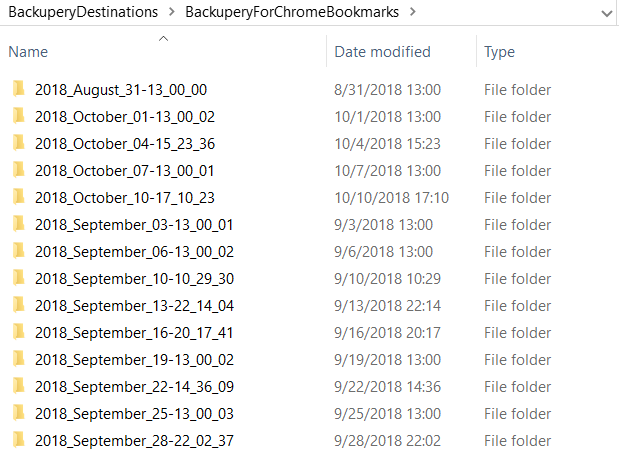 Probably you have read How to backup Chrome Bookmarks automatically so in this post we are going to show you how to restore Google Chrome bookmarks if you are using Backupery for Chrome Bookmarks. 1. Choose a snapshot of bookmarks that you wish to restore. Each directory is a backup snapshot of your Google Chrome bookmarks. Each directory name is a name of your Google Chrome profile. So, for example, if your have three profiles in your Google Chrome, say Peter, Jane and Derek, then you will see three folders: Peter, Jane and Derek. Each folder contains a snapshot of bookmarks file for the specific profile. That is Peter folder contains a snapshot of bookmarks from Peter profile, Jane folder contains a snapshot of bookmarks from Jane profile and so on. Remember the location of the snapshot file you wish to restore, we’ll need it a bit later. 3. Overwrite the current bookmarks file with the restored one. Open the desired profile directory, say Profile 3. As you will see, among other files and directories there are two bookmarks files – Bookmarks and Bookmarks.bak. You need to replace current “Bookmarks” file with the restored one. So, just rename Bookmarks to something like Bookmarks_old, then copy the backup file that you wish to restore to the folder and rename the file to Bookmarks. Now your bookmarks are restored! You could launch and use your Google Chrome browser. To start protecting your Google Chrome bookmarks download Backupery for Chrome Bookmarks now! Next Next post: Backupery for Evernote 2.1 and Backupery for Chrome Bookmarks 2.1 are out!